Though perhaps behind many communities outside of the U.S. when it comes to pedestrian and cycling infrastructure, Shoreview is well ahead of most U.S. exurbs. 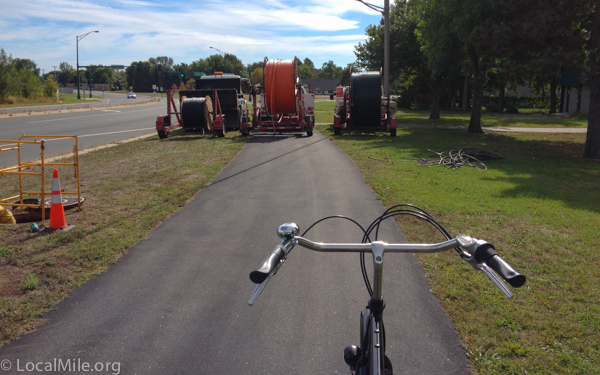 Nearly all residents can, relatively safely and comfortably, walk or ride a bicycle to local amenities and Shoreview appears to have plans for continued improvement of this infrastructure. Shoreview’s 2008 Comprehensive Transportation Plan indicates a good understanding of active transportation and a desire to provide a complete network of segregated (off-street) bicycle and pedestrian ways that allow every citizen in Shoreview to safely and comfortably walk or ride a bicycle to local amenities. Shoreview also has a Bikeways and Trails Committee with a major focus on bicycle transportation infrastructure throughout the city. 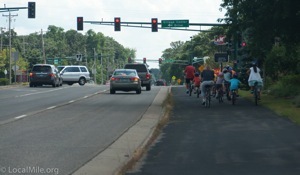 Shoreview today has a fairly extensive network of segregated Multi-Use Paths (MUPs). 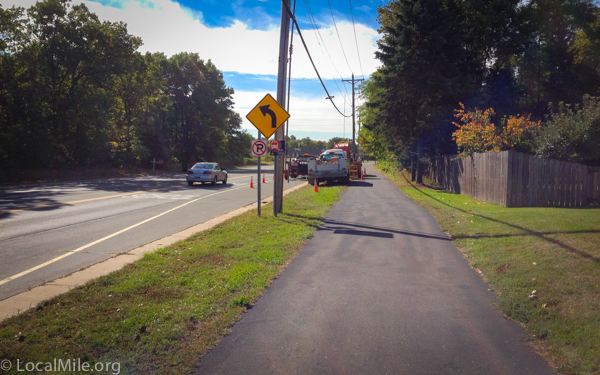 One of the major holes in this network, Hodgson Road south of 96, is scheduled to get a segregated path in 2015. Instead of making people wait through an entire light phase, many crosswalks give an immediate white crossing light after pressing the beg button, a very welcomed feature. Shoreview’s paths are kept in fairly good shape throughout the winter and are plowed quickly after snowfalls and again after road plowing when necessary. Drivers in most of Shoreview are generally safe and courteous to pedestrians and those riding bicycles (perhaps because so many walk and ride themselves). 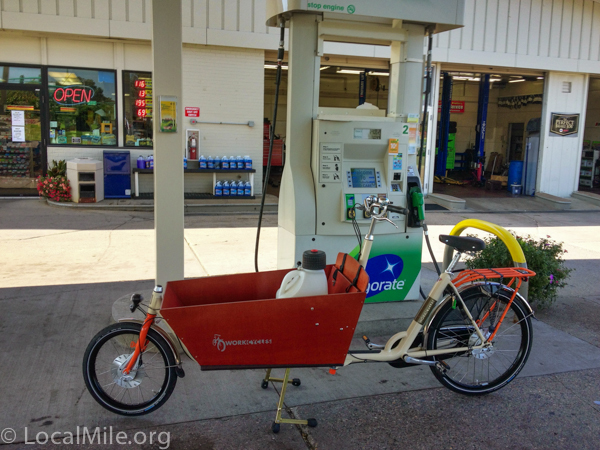 In much of Shoreview, walking or riding a bike for local transportation is not just feasible, but quite enjoyable. Shoreview’s paths, like the one to the left, are becoming more popular each year. 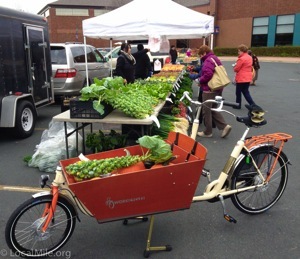 One 42-year resident recently told me that she’d not really considered riding a bike for local errands until just earlier this year when it occurred to her that there were bike paths everywhere she usually goes. She bought a bike at Now Sports and said that it has been one of the delights of her life. Now she’s trying to talk her friends in to riding. Shoreview is just now beginning to see the benefits of this investment. Like the woman above, many residents are only recently beginning to think of walking and bicycling as an alternative to their lifetime habit of driving a car for even the shortest of trips. Shoreview has done much better than average in housing value recovery over the past three years and this infrastructure is likely a key contributor in that. Shoreview’s investment in good pedestrian and bicycle infrastructure will pay many dividends to Shoreview residents in the coming years. Even in the best of cities though, there is room for improvement. Here are some wishes for Shoreview.